Silverline chemicals, is one of the largest manufacturers & exporters of Black Pepper Oleoresin in India. Silverline’s facility is an ISO 9001:2008, ISO 22000 , HACCP, GMP , Organic , Kosher, HALAL certified company. It also meets IP, BP, NF and USP grade specifications. Strict quality standards are maintained through in-house fully equipped QC & QA lab along with separate microbiology laboratory, equipped with latest HPLC machines. The black pepper oleoresin is obtained from properly ripened seeds of black pepper. Dried peppercorns are completely processed with the blackened external covering. The extraction is performed by percolating with variety of solvents, primarily hexane, which are removed prior to use. Black pepper oleoresins have heavier flavor and is far more popular than other varieties. Black pepper oleoresin represents the total pungency and flavour constituents of pepper obtained by the extraction of ground pepper using solvents like ethanol, acetone, ethylene dichloride, ethyl acetate etc. Black pepper oleoresin offers considerable advantages over whole or ground spices in that they are uniform in composition as well as strength. Contaminants like mould and fungus are absent in the oleoresin and hence can be directly added to any food material after adjusting the flavour concentration. The extractives are usually made available in both oil soluble and water dispersible forms and also in dry forms of the extractives. 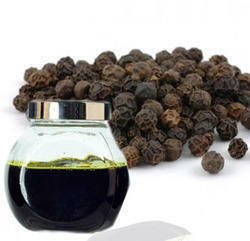 Uses : Black pepper oleoresin is widely used in food industry as a coloring and flavoring agent. The oleresins represent complete spice flavor whereas essential oils only the aroma. Bland With : The above quality is our standard specification. In addition to this customized blends are also offered to meet specific requirements. Extraction Method : The above quality is our standard specification. In addition to this customized blends are also offered to meet specific requirements.